Open Europe: Is a bailout of Spanish banks now imminent? At the beginning of April, we published a briefing predicting that Spanish banks were heading for a eurozone bailout - hoping that we wouldn't be right. Well, alas, it looks like we were. It's been another frantic week for the eurozone, with Spain taking centre stage amid reports that a request for a bailout to help deal with its troubled banking sector might actually be a matter of hours away. Here is an overview of where we are at. In a press conference early this afternoon, Spanish Deputy Prime Minister Soraya Sáenz de Santamaría has also denied that eurozone finance ministers are to hold a conference call tomorrow - as suggested by the sources quoted by Reuters. The Deputy Prime Minister insisted that the government will wait until after the publication of the IMF report on the Spanish banking sector (due on Monday) and the results of the two independent audits of the real estate assets held by Spanish banks (due on 21 June at latest) before making a decision on whether to ask for financial assistance. All kind of numbers have been floating around during the week, from the €80-100 billion mentioned by Spanish MEP Antonio López-Istúriz, who also happens to be the Secretary General of the European People's Party (EPP), to the €60-100 billion estimated by credit rating agency Fitch. At the end of the day, Santander boss Emilio Botín, the first to mention the €40 billion figure while he was accompanying the King of Spain on a visit to Brazil last weekend, might have got it right. Germany is reportedly considering a 'face-saving' compromise, which would see the bailout money going directly into Spain's national bank restructuring fund (FROB). 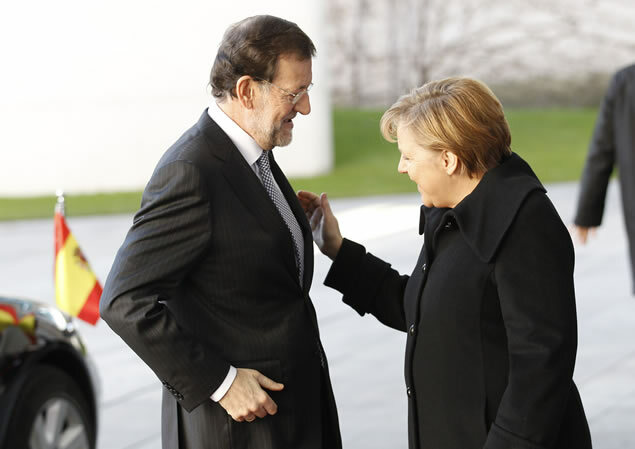 A senior German official explained that, under this plan, "conditionality would be focused mainly on the banks, because Spain has already tackled the other reforms." In theory, this arrangement would not break EFSF rules - it would be money going to the Spanish government first, and then to the banks. Most importantly for Spain, it would also mean that the country would be imposed softer conditions than those attached to the Greek, Irish and Portuguese bailouts. Millions of Spaniards are bracing themselves for what could be a decisive weekend for the future of their country in the eurozone. If a request is made for external assistance, even a win for La Roja against Italy on Sunday evening may not be enough to soothe their fears. 1. As mentioned a couple of times earlier this simply looked unavoidable. The markets seemed to have little confidence in the measures, LTRO money was drying up, and economy was moving into the wrong direction (both in Spain as in Europe as a whole). 2. We have to see what happens with Italy. It looks slightly better but is also moving in the wrong direction and fast as well. As it already is close to the cliff, imho it looks >50% chance it will need a bail out not long after Spain. 3. How much? The amounts mentioned are imho rubbish. You donot need a recap on basis of dodgy capital amounts on balance sheets which simply have insufficient reserves/provisions for the skeletons (holding Spanish debt and RE-loans as well as general bad economic situation) in the cupboard. You need enough capital to meet the market's estimation of the provisions that are required in real life. After the first bankrevue it looked like something between 50-100 Bn. As we donot know the exact amount probably to be sure on the high side. Furthermore the situation has got worse. So my best guess somewhere between 100-200 Bn will be required to stabilise the bankingsituation at this moment. Less will not do. Doubtful as recent history shows that amounts decided upon were basically always too low and subsequently didnot properly do the job. Something like that is also more realistic seen the nearly 20 Bn already required for Bankia. So likley 150 Bn required to calm the nmarket and likley getting less than 100. 4.How? Seen the time it has to go via EFSF. ESM is simply not yet in place. Basically any other way than directly to the Spanish government would be legal rubbish. So we probably get that anyway. Opening the next round of discussions. After the one about the rescue itself has stopped (or at the same time). The timelag between measures and approval is simply getting wider we are getting in that respect furtehr and further behind the curve. Looks simply as a next step in a long chain of unfortunate events. A point I forgot to mention earlier. It is already highly doubtful if the EZ will be able to enforce rules in the seperate countries, seen the history with Maastricht. Allowing Spain now partly to get away with things, simply will show that measures only limitedly can be enforced. Especially with the big countries, although as these seen the size are by far the most essential to be rescued resp. not to get into trouble. One would expect even worse for Italy and again more worse than that for France if that would happen one day. This clearly shows itself as a set of rules that will not work when it is needed. correction Ireland 60 bn fore housing bubble: then Spain 500 bn. + correction for all the second homes of north EU that are recession vulnerable. 100 Bn is CRAP. Dutch morgage deduction revomal is cathastrophe. No more dreams for the Dutch.. then the go: braindrain/ runaway and leave with debt. now already 1/3 dutch houses +300k with rest debt. The Spanish bailout proposal seems to be its own beast: the usual pros and cons, but you clearly understand that. Although just before I stumbled onto a pretty neat article that seems to summarize the whole situation quite well (http://www.pressdisplay.com/pressdisplay/showlink.aspx?bookmarkid=IWR5HF1GMHD8&preview=article&linkid=288dc1ef-2339-41ae-842b-4867777c807d&pdaffid=ZVFwBG5jk4Kvl9OaBJc5%2bg%3d%3d). In any event, I’m curious to see where this whole thing goes. Fingers crossed for the EU.